Power Town is a visual Dakota Energy can use to demonstrate dangers on the farm and how they can be avoided. The program is given several times a year at various events. The display town is energized and when Neon Leon or Lightning Liz touch an energized item the neon gas inside their body glows, visually showing that they were shocked. “The Story Behind the Switch” is a 45-minute program about electricity presented by a East River demonstrator – explaining what electricity is, how it is made, how it gets to where it’s going and how it has become part of our lives. About 20 minutes of the program is dedicated to questions from students and hands-on demonstrations. 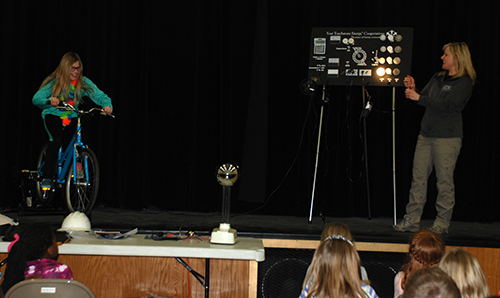 The program teaches children about conductors, current, insulators, voltage and other related topics. including electrical safety near water, kite flying and tree climbing safety precautions near power lines, and operating farm equipment near power lines. There is no charge for the program. If you have further questions about bringing “The Story Behind the Switch” to your school, contact Member Services at 1-800-353-8591 or (605) 352-8591. A student generates electricity to power different lights and appliances during a school demonstration of the Story Behind the Switch.